Day 1 of the computer training, complete! Tyler kicked off his first day of computer training for the pastors and church leaders in the Navigators 2:7 class. There were eight students. 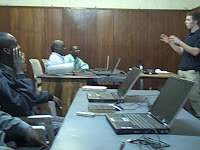 It is hard to even begin to describe the complexity of teaching these pastors how to use a computer. I guess the best way to describe it would be to pretend you went into the jungle and you tried to teach the people there how to use a computer. They not only had no idea how to use a mouse, but what a mouse was. (I said it was like a very small rat!) They didn't know when to click, double-click or move the cursor with the mouse. They got the back space and the front space confused. It was just crazy to see grown men who had no idea how to use a computer. Yet, there was something just really cool about helping these pastors in the basics of the computer with the ultimate goal to teach them how to use the Logos Bible Software. Tyler did really great and yet I know he felt overwhelmed by how many things in the computer process that you just seem to intuitively know, like when and how to double-click your left mouse button. They loved learning how to use the computer, as evidenced when they clapped after successfully opening a program or turning off the computer. 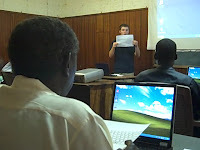 During the training, one of the pastors showed me an advertisement for a company that trained people how to use the computer. 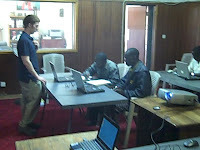 It cost k25,000 kwacha for an intro to computer class and 35,000 kwacha for an intro to Microsoft word. 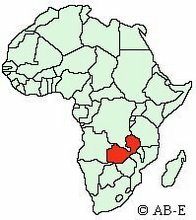 In total, it would have cost them 60,000 kwacha or $12.00 dollars to get this training which would have been too much for the average pastor. Tomorrow, Tyler will teach the Action Bible Institute pastors for their first day on the computers. We can't wait. Lol, that has to be the best blog post I've read in awhile! Good to see you to meshing.